A letter from America Brazil. Dear Decorfolia friends and clients of, it's Guy here an ex-DecorF employee. You may have seen me around your office floor, rummaging around in the foliage, between April and September 2001? I hope that you remember me!? Hello to those of you who do! I'm the one that left you all and went to sunny Brazil and I'm writing to let you all know how I'm doing... hopefully you're all interested. I recall a joke that I heard some months ago about how to describe Brazil. It's a little lost in translation, but basically here in Brazil we are blessed with only two seasons- A hot one... and a hotter one. I'm not sure which we are currently experiencing, but the days and nights are clear and hot. The rain has now left us, having waded through the wet season, leaving me with a lot of watering. So, to tell you what I've been up to... Well, I came out here to start up and run a medicinal plants project, some of you may have read about it on our web site www.iracambi.com. The aim is to make an economically viable enterprise by sustainable harvesting and reforesting indigenous plants from the Atlantic Rainforest. The aim is to create a profitable reforestation program and at the same time to promote the intrinsic value of the forest by demonstrating its uses. My brief: Do the above. I guess that now is a good time to give a progress report, as I am half way through my one year stay here. Basically, all is going well. We are making progress every day and I am enjoying the experience immensely. Every day provides a new challenge that requires a solution- a little like trying to find your way into a locked or engaged office, un-noticed, that contains our valuable plants, crying for attention. To take you back to the beginning....October 10, 2001, my first day at work, having arrived on the farm the evening before. Tree Planting. The rains had just arrived after a long dry season and the plants in the nursery were ready to be set free. We always plant indigenous tree species and some are also medicinal, like Ipe Roxo (Tabebuia heptphylla), which is a slow growing tree whose wood is extensively used in construction, but whose bark also acts on the liver, preventing colds and influenza and reducing cancerous growth rates. 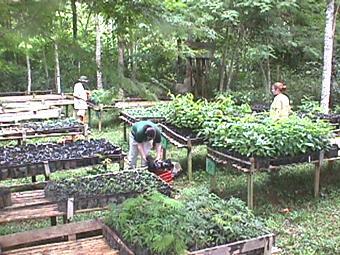 Planting is all done by hand, including the carrying from the nursery up the mountains to the planting site! Planting was my immediate responsibility, as is everything 'planty', including the garden and vegetable plot. We now have two functional nurseries in total, capable of holding over 4000 plants (which is my aim to have ready for next season). 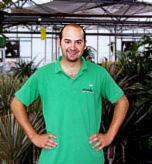 Last season only 1400 were grown and planted, due to inefficiencies in the nurseries, so lots of changes have been made. 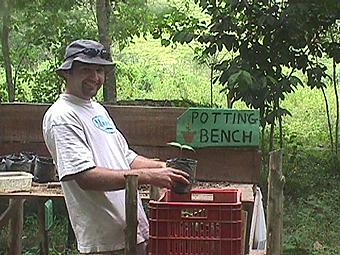 We now have compost bins, using weeds cut from the farm, to improve soil quality for germination and growth. There is now also: a germination bench (seeds used to be sewn directly into pots to germinate) which uses wooden seed trays; a potting bench where seedlings are transplanted into individual pots; and a hose pipe watering system. Hopefully all of this means that it is now possible to lift 8 plants in a crate, on your own, and we're not filling 4000 pots, only for 1000 of them to produce seedlings! Right now, there are about 1500 plants in the nursery growing well and lots more nearly ready for potting or germinating. These are of about 20 species, from seed either collected by me or Robin, my host, or from our local Vicosa Uni.. All the plant beds also needed resurfacing with bamboo. So what do I do now that all this is over? I concentrate on the medicinal plants of course. When I arrived Robin gave me two things, a machete and a list of 20 plant species that may be viable for the medicinal plants project. Both have been used extensively and both are now considerably smaller than when I received them; the machete broke cutting down a bunch of bananas and the list of species has been whittled down to 7. I rejected those species that I considered to be of little importance commercially, or that can't be sustainably harvested. The 7 remaining species I am now researching, trying to grow (so far I've managed to get at least one success from each species either from cutting or seed), detail how to replant as part of a forest ecosystem, harvest, prepare, and make into a saleable product. Currently I am building a drying unit for the plants and then I can start harvesting. Of course it's not all been work and no play, I've always left a little time for roaming around or joining in a party. I spent New Year's Eve on Copacobana beach in Rio de Janeiro, then spent 5 days on a beautiful tropical island called Ilha Grange, 4 days in a beach side town for Carnivaaaal, set a new record of climbing both our mountain peaks in one day, absailed down a waterfall, had the occasional night out in our local village/town and just last Friday was interviewed on the local radio and for the paper! Six months well spent, I just hope there is as much fun, excitement and achievement in the next six. Well, I think that I've said enough and hope I haven't bored you. Its been fun writing this, thanks for taking the time to read it.